Another week, another hatful of chances, another loss. Once again, we can only hope that our at some point we find some luck and composure in front of goal. In front of a bumper Community Day crowd in this forthcoming game against Gillingham would sure be a good place to start. Mark Robins intimated last week that he may look to revert to basics over the coming weeks to rebuild confidence and end this winless run. There is a danger that it’s throwing the baby out with the bath water after some good recent performances have gone unrewarded, however, we are in a situation where another month of poor form could put us in the relegation mix with a fairly inexperienced squad. The safer, less exciting approach is likely to prevail. While the transfer deadline day signing of David Meyler should inject the side with some important experience, physicality and hopefully quality, the loss of Jonson Clarke-Harris leaves us without a target-man. Although Clarke-Harris’ goal return has been underwhelming, losing a player who can hold the ball up to either relieve pressure on the defence or bring other attackers into play could be a glaring oversight from Mark Robins. Clarke-Harris’ exit probably means the line-up of the front four this week won’t be too dissimilar to the Blackpool game. If Bright Enobakhare can step up as a creative number 10 figure, it lessens the need to have a big man up top who can bring others into play. Furthermore, Amadou Bakayoko will surely be handed opportunities between now and the end of the season to show what he’s all about. Elsewhere, it wouldn’t be a surprise to see Junior Brown started in defence ahead of Brandon Mason in an attempt to add further experience to the side. 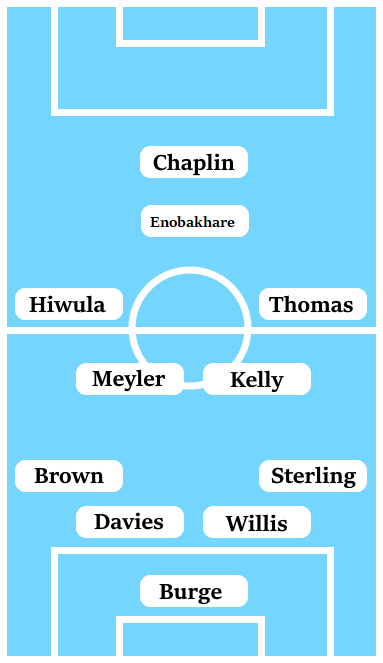 The central defensive pairing could be any combination of Jordan Willis, Tom Davies, and Dominic Hyam, with perhaps the Willis-Davies partnership being preferred for their battling qualities.